I recently read two debut collections of short stories, back to back. This wasn't intentional, but although they are not brand new books, they were new to my library and both looked appealing. And I did enjoy them, to different degrees. Here are a few thoughts on both. A collection of connected family stories circling around the Lees, a Canadian-Chinese family living in Edmonton, through the 60s and 70s, this has warmth and humour. The narrator is usually the younger daughter, although some of the stories come from different perspectives. The book is arranged in sections named after menu items on a Chinese Canadian restaurant menu, and most of them do focus on the kind of domestic, interpersonal issues represented by food and the way it plays into identity. I found it really absorbing reading; Chow has a unique story to tell, even with the reliance on the kind of family stories we might expect to see in short fiction. Her characters develop more complexity as you read, and see them in different situations and at different ages. Her narrative style is also quite fascinating -- she has a habit of adding in parenthetical afterthoughts or commentary, often ironic and/or funny, often a judgement made by an older narrator/writer. It's very entertaining, and I found that particular habit intriguing. I really liked this book. There was good writing and lots of great imagery, as well as things happening -- not just vague or open ended stories about emotional exploration of the self. This collection has been getting quite a bit more attention than the first, and it is a solid book. My personal preference was for Paper Teeth, as many of the stories in Bad Endings sounded vaguely familiar, similar to much contemporary Canadian short fiction, at least to me. There were a couple of stories which really stood out for me, especially the one which inspired this beautiful cover art. 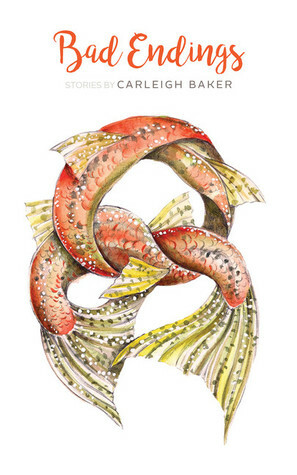 In that story, there are vivid descriptions of wild rivers, salmon, hard work -- it's active and energetic. But generally this collection felt MFAish, and not the ideal one for me. Many of the stories featured young people in some kind of life transition. There was drudgery, uncertainty, a bit of squalor, and frequent trailings off into a kind of ending. This may be more resonant for and reflective of millennial life at this moment; perhaps younger readers will engage more wholly with this collection. I admired her writing ability and the lack of academic navel gazing in this book, but it didn't catch me entirely. How about you? Have you read any good short story collections lately? Anything you would recommend? Paper Teeth does sound interesting. I don't read enough Western Canadian fiction, so it will help me there too. P.S. Sorry to be dumb - but is MFA 'Master of Fine Arts' - or something else? It's a good one. You might also like some of Jacqueline Baker, Sarah Klassen, or Dianne Warren's short fiction, mostly set around Saskatchewan. And yes, MFA is master of fine arts -- I don't mean to sound snarky, just that some of the writer's workshop feel comes through to me. Thank you for the author suggestions! I have read Warren's Juliet in August but have not heard of the others. It's amazing to me how regional book news is! A few short story collections I've enjoyed recently... A Certain Grace by Binnie Brennan, Peninsula Sinking by David Huebert, A Bird in Every Tree by Carol Bruneau, and All the Beloved Ghosts by Alison MacLeod. Thanks for the suggestions -- I haven't read any of these! 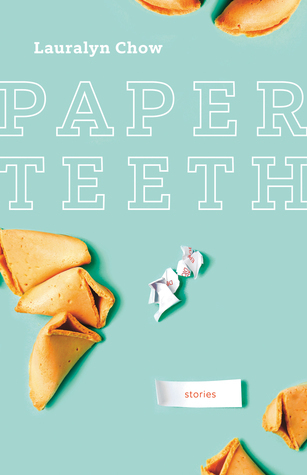 I just loved Paper Teeth, the entire book, every single story. And I thought there were some impressive elements in Bad Endings too (my favourite was the first story) and I hear what you're saying about the workshopped-feel to some of them. I'm back into Mavis Gallant these days, just beginning The Pegnitz Junction, but other than that I'm slow on Canlit stories this year.